White and red stripes filled roll. 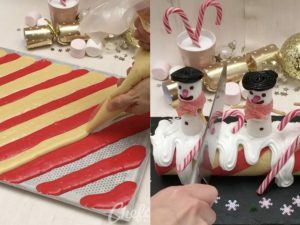 Alternate white and red stripes and make a perfect Christmas dessert. 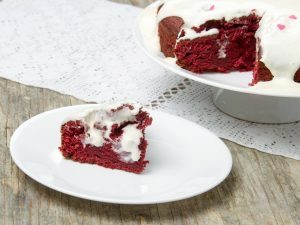 Ingredients: 5 eggs; 150 gr sugar; 150 gr flour; 1 egg yolk; red food coloring; 200 ml whipped cream; vanilla; 200 gr white chocolate. To decorate: chocolate sticks; marshmallows; candies; candy cans; melted chocolate; whipped cream. 13) Decorate with with whipped cream and other candies. The most fun appetizers for Winter!